Best results – unmatched ergonomics! Pipette design and good pipetting practice have always been in the focus to improve ergonomics and reproducibility of pipetting. For the design of the ASSIST, INTEGRA kept these critical factors in mind but went even a step further: by automating our multichannel pipettes. Simply mount a VIAFLO electronic pipette onto the ASSIST to start automated pipetting. 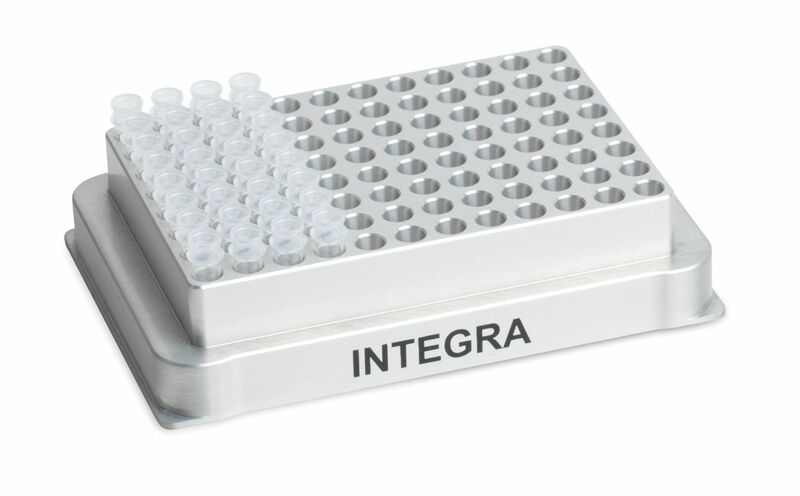 This prevents you from repetitive strain injuries (RSI) while increasing the reproducibility of prolonged pipetting protocols such as serial dilutions, plate filling and reagent addition. Simply mount any INTEGRA VIAFLO electronic pipette onto the ASSIST pipette adapter, choose a pipetting protocol and press the run button. ASSIST will then obtain the protocol via Bluetooth from the VIAFLO electronic pipette and automatically execute the desired application. No matter how light and well balanced a pipette is, prolonged pipetting tasks remain physically and mentally challenging. While some steps always need to be performed manually, many other steps can be automated. ASSIST lets you switch between the manual and automated pipetting tasks on the fly, relieving you of the routine pipetting. The major source of problems in pipetting performance are human errors. Typical parameters influencing the performance are tip immersion depth and pipetting angle. The automated pipetting capability of ASSIST ensures these parameters are always the same, resulting in increased reproducibility. Also, ASSIST makes no pipetting mistakes! The pipette adapter of ASSIST allows the use of all VIAFLO multichannel pipettes. The width of the adapter can be adjusted so that 8-, 12-, and 16-channel pipettes can fit. The pipettes cover a volume range of 0.5 – 1250 µl. Plates of 6-wells to 384-wells can be used. 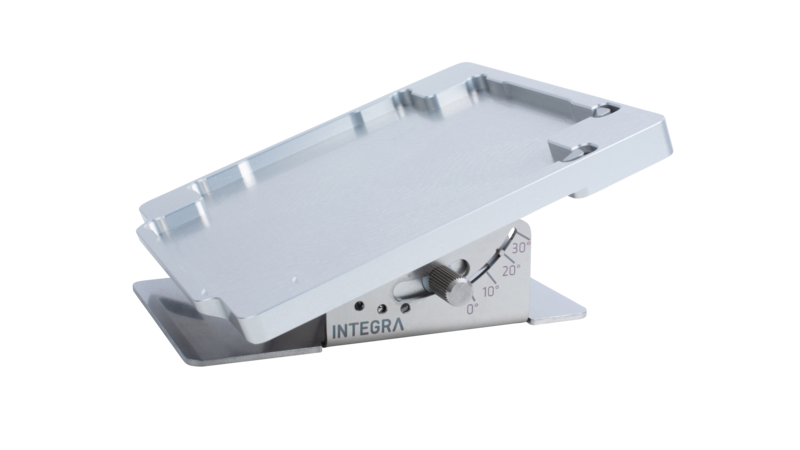 The plate sledge accommodates the plates either in portrait or landscape orientation. The VIAFLO pipette and ASSIST communicate via Bluetooth, supporting simple wireless connectivity. Pipetting protocols are transmitted from the pipette to ASSIST and are then carried out automatically. Protocol setup and selection is done using the pipette’s intuitive user interface. It is based on the popular Touch Wheel and allows extremely fast menu navigation and volume adjustments. Simply by moving a finger over the touch wheel, menus and settings can be accessed. Three predefined protocols allow a quick start: Serial Dilution, Repeat Dispense and Variable Dispense. For more elaborate pipetting routines, custom programs can be created in an easy step by step setup. GripTips are always firmly attached and perfectly aligned, regardless of how many side well touch offs are performed. You no longer have to hammer your pipette tips on or worry about pipette tips falling off! The rim (3) of the GripTips will snap over the Multi-Lobes (1), attaching firmly. As a result, GripTips will never accidently fall off. A shoulder (4) provides a positive stop to prevent over-tightening of the tip. It can only be attached up to that point and no further, ensuring that all tips are at the same height. That means, the tip is either on or off, but nothing in between. "Easy to use, great precision." "This machine was not only the most reliable with consistent volume accuracy but the user support was above any (including Eppendorf) that my genomics core has encountered. Just amazing!" Serial dilutions can be tedious due to the many mixing steps that are required. ASSIST carries out your serial dilution protocols automatically. Simply define the number of mixing cycles, speed and mix volume. Serial dilutions are often carried out with the plate in portrait orientation. This allows more samples to be diluted. ASSIST allows working in landscape and portrait format. The concentrated sample can be drawn from a reagent reservoir, a PCR tube strip and the plate itself (e.g. First column). In addition, the sample can also be aspirated with the pipette from an external source before placing it on the ASSIST and starting the protocol. Filling multiple plates might not be a difficult task but is strenuous nonetheless. In order to improve pipetting ergonomics, manual pipetting should be minimized. ASSIST helps you to fill microplates without risking repetitive strain injury. Draw reagent from the reagent reservoir, a PCR tube strip , the plate itself or an external source to add it to the target plate. An optional mixing step helps to achieve a homogenous distribution of the sample. For a precise liquid transfer and to make sure that no remaining liquid clings to the tip end, performing a touch off is common practice. ASSIST allows both a touch off on the side wall of the well or inside the liquid. The ASSIST personal pipetting assistant offers optimized programs for use with Linkage Biosciences LinkSēq™ tissue typing products. It has been demonstrated to increase confidence in a laboratory’s tissue typing workflow. Offering consistent dispensing volume, tip immersion depth and pipetting angle, the reproducibility and accuracy of tissue typing protocols are increased, while the risk for human errors is minimized. Find here a quick overview of the product specifications. More detailed information can be found in the download-section below. Use the GripTip Selector Guide to find your pipette tips. Are you using the right micropipette?